When you are having dental problems, the root of the issues may be uncovered in a simple X-ray. 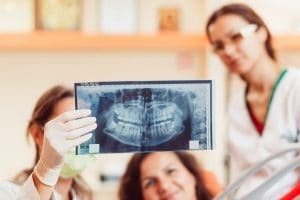 Although certain cavities may be detectable through a routine examination, there are particular problems that may remain hidden within a tooth. Thanks to an X-ray, your dentist will find the problem and be able to come up with a solution. A dental X-ray is similar to a conventional X-ray and provides a picture of teeth and the surrounding soft tissue. A technician will place a film inside of your mouth and cover your body with a lead apron. This apron shields you from dangerous radiation. After the X-ray is taken, the picture will be available within minutes, and your dentist will be able to get to work. What to Expect During an X-ray? X-rays are simple and take only minutes to complete. Unlike other dental procedures, there is no pain involved. Sometimes, a person’s mouth is tiny, so it may be challenging to hold the film between his or her teeth. Also, his or her gag reflex may become a problem. To avoid issues, it is advised to relax and breath deeply while the X-ray is taken. X-rays produce small amounts of radiation. However, a person with normal health should have no negative side effects. Unfortunately, pregnant women and individuals with thyroid disease may be at risk for complications. It is best to discuss the situation with your dentist. Thanks to advanced technology, radiography is able to produce clear pictures. When your dentist can view the condition of your teeth from the inside, he or she can diagnose problems early. This prevents extensive tooth damage or total tooth loss. Dr. Dana Walters commonly performs dental X-rays on patients to uncover hidden cavities, impacted teeth, abscesses, and other possible problems. To learn more about the procedure and other dental tips, feel free to contact his office today.